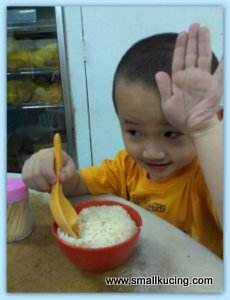 Yesterday, Uncle Arthur commented "No food?" . Well, here is a food post that Mamarazzi is sure Uncle Arthur would love. Very long time have not been here for quite some time. Mamarazzi felt like eating "porky" the other day. Kepong is too far and we were rather hungry at that time. Hence, Papa drove to Subang Jaya and had Yu Kee BKT lo. Foreign worker took our order. A bit "Chicken and duck talk" coz Mamarazzi was not sure in what language to talk to the boy. Usually we would order a "Mixed BKT" for one person and then an extra bowl of intestine and stomach. Since the foreign worker does not understand, Mamarazzi "hentam" and ordered a "Mixed BKT" for one person and the innards for one person. STop.....Take photos first! Anakrazzi LOL. The BKT with yummy intestine(RM10). Mamarazzi and Papa liked but I don't like. Vinegar Pork Trotters(RM10). Used to be Mamarazzi's favourite but now she had tasted the Kepong ones, she preferred that. Anyway, this one is good enough for those who does not like spicy pork trotters. Wah... makan BKT until bukak kasut. LOL...must be really sedap. Hahahahaha!!!! No wonder WKS said we're having a competition or what... My post today on kueh chap! Yu Kee...not the same as Yew Kee, right? Annie-Q and friends were talking about Yew Kee on Facebook - said so good. I think that STALL's in Cheras...and I hear VERY expensive. hahaha, since when mamarazzi's blog being labeled as food blog?? must have food everyday one meh?? long time never had BKT already lah.. Sounds delicious --and I'll bet that Uncle Arthur will love it!!! BKT, I also cut down on taking this dish. It is not so healhty. 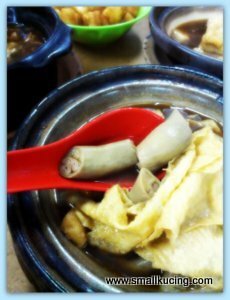 I just had Yew Kee, quite nice with the strong herbal taste. The innards were done very clean. Not sure if it's expensive compared to other BKT but I think ordering extras like 'ghost fried oil', vege and tofu puffs sure adds up to the bill. wahhh..u pakat with stp ke.. today both of us almost same posts.. hehee.. 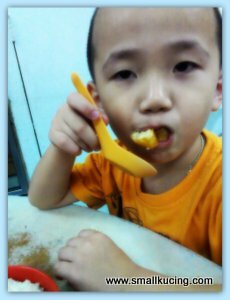 I normally eat at Chuan Chew. 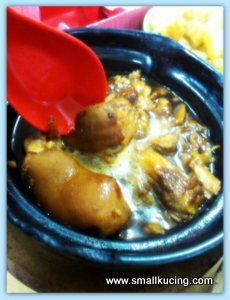 BKT in claypot is always best! The last pix makes me laugh. U're cute lah, mama! My husband just ajak me for BKT that day but I think too heaty for me lah. Having tried this place before, for me the food is so so and nothing much I will jump about. BKT is an indulgence for me esp the spare parts are also my fav too with plenty of chilly padi dripped with soy sauce. Kepong have good pork trotter vinegar? Where?